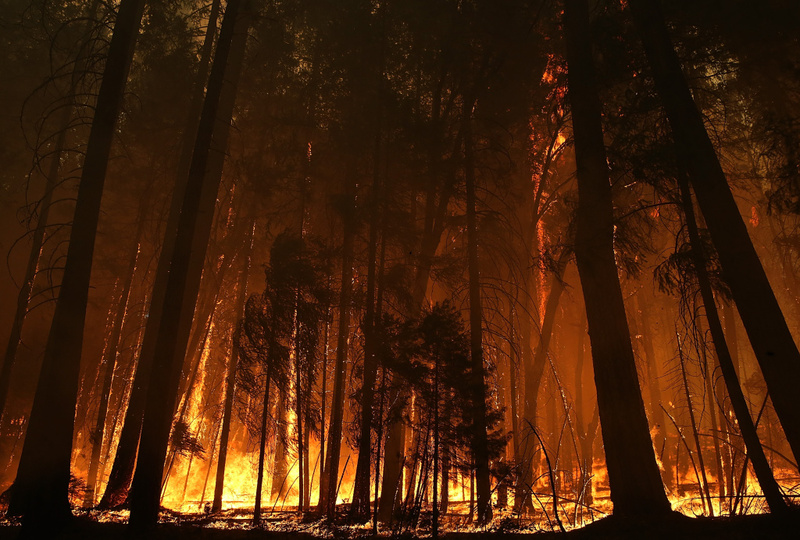 Flames from the Rim Fire consume trees on August 25, 2013 near Groveland, California. The Rim Fire continues to burn out of control and threatens 4,500 homes outside of Yosemite National Park. Over 2,000 firefighters are battling the blaze that has entered a section of Yosemite National Park and is currently 7 percent contained. The massive Rim Fire that's scorched more than 225 square miles near Yosemite National Park is now the largest wildfire in state history. Firefighters are worried that high temperatures and unpredictable winds could spread the fire as far as the Hetch Hetchy reservoir where it could possibly jeopardize San Francisco's water supply. Close to the fire, in the Sierra community of Tuolumne, Ike Bunney and his wife Shary have been forced to evacuate more than a dozen horses from their dude ranch. Ike joins the show to talk about their experience. Most experts agree the wildfire situation in the West is only going to get worse. A combination of climate change and greater populations in fire-prone areas almost certainly mean it will cost more to fight fires in the future. Yet the funding for fighting wildfires — and it's almost all federal money — hasn't kept pace with the threat. For the second straight year, the Forest Service has depleted its firefighting budget, and its been forced to use money targeted toward things like forest fire prevention. When a wildfire is blazing, no one wants the people who are managing the fire fighting effort to be thinking about dollars and cents, but that might be the case. Bill Gabbert is a longtime wildland fire fighter, who worked in Southern California before moving to South Dakota, where he managed fire fighting efforts in national parks. He runs WildfireToday.com.